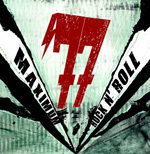 Returning with another album of their retro Seventies hard rock is Spain's 77 with Maximum Rock N Roll. And they still sound much like Bon Scott-era AC/DC, and likely make no apologies for it. 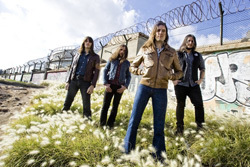 After all, according to Classic Rock magazine, their band name comes from the year Let There Be Rock. I know the band has their hearts and riffs in the right place, but there's no 'maximum' anything about Maximum Rock N Roll. It's still derivative, second rate, AC/DC licks and tricks. Yet, it seems that they bump up the boogie blues thang a bit more with Jazz It Up and Take Me Or Leave, for instance. That's a good thing, yet most everything sounds droll, simply dragging along. Frankly, I found only two song interesting: the title cut and Jazz It Up. My advice: dig out your AC/DC LPs and listen to the real thing. Get out your AC/DC LPs and listen to the real deal.